"To pet or not to pet?" 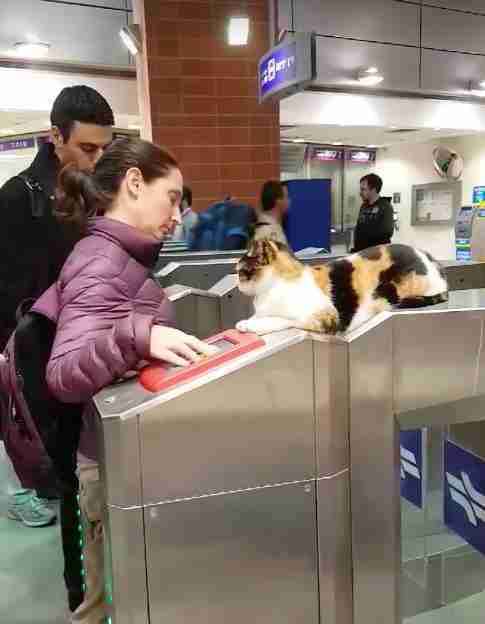 That's the dilemma facing the daily commuters at a train station in Israel pretty much every day, according to Dan Kashani, one such commuter, who finally decided he just had to film what regularly happens with a local cat known as Shawarma. Ever since the street cat was taken in by the local station in Petah Tikva, a city near Tel Aviv, Shawarma has been a fixture of the station — a literal fixture. "I was coming back from work," Kashani said. 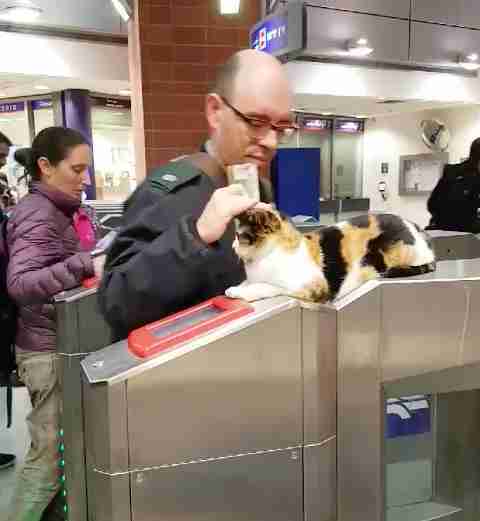 "As soon as I got to the gate I saw the cat lying on the gate and it was very cute — it made me smile." Even though Kashani has seen Shawarma before, this time he decided he needed to capture the moment. Kashani's video shows Shawarma relaxedly lounging on one of the turnstiles as passenger after passenger swipes their tickets. Since Kashani posted the video of the local celebrity, she's become something of an international icon, garnering interest from all around the globe. Some viewers couldn't believe just how many people passed by the cat without so much as acknowledging her ("Pet the damn cat you animals!" one commenter wrote), but according to Kashani, Shawarma has a reputation for being slightly unpredictable. "You can pet her if you offer your hand and wait and see if she's into it," Kashani told The Dodo. But sometimes she's not into it, and she'll let people know with a slight scratch or bite. "She has to be into it." But Shawarma did accept a quick head-petting from at least one passenger that day — the video captures the sweet, if fleeting moment. After the video got shared over and over, not only did Kashani get 1,200 friend requests on Facebook, he also received a call from the local mayor. 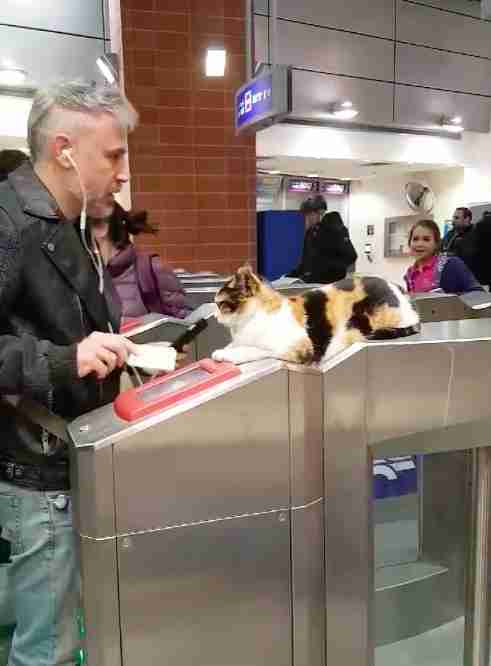 "The mayor called me up and said, 'I want to meet that cat — what station is it?'" Kashani said. "I told him and he actually went there and met the cat." "He gave her food and treats and a toy and petted her," Kashani said. "I was like, 'You're a cool mayor, I didn't vote for you, but I will from now on!'"